In past ages, those who dared to speak out against tyranny—viewed as an act of treason—were blinded, castrated, disfigured, mutilated, rendered mute by having their tongues cut out of their heads, and ultimately crucified. It’s a diabolically ingenious tactic for muzzling, disarming and ultimately eliminating one’s critics or potential adversaries. However, where many Americans go wrong is in assuming that you have to be doing something illegal or challenging the government’s authority in order to be flagged as a suspicious character, labeled an enemy of the state and locked up like a dangerous criminal. In fact, as I point out in my book Battlefield America: The War on the American People, all you really need to do is use certain trigger words, surf the internet, communicate using a cell phone, drive a car, stay at a hotel, purchase materials at a hardware store, take flying or boating lessons, appear suspicious, question government authority, or generally live in the United States. With the help of automated eyes and ears, a growing arsenal of high-tech software, hardware and techniques, government propaganda urging Americans to turn into spies and snitches, as well as social media and behavior sensing software, government agents are spinning a sticky spider-web of threat assessments, behavioral sensing warnings, flagged “words,” and “suspicious” activity reports aimed at snaring potential enemies of the state. What’s more, the technocrats who run the surveillance state don’t even have to break a sweat while monitoring what you say, what you read, what you write, where you go, how much you spend, whom you support, and with whom you communicate. Computers now do the tedious work of trolling social media, the internet, text messages and phone calls for potentially anti-government remarks—all of which is carefully recorded, documented, and stored to be used against you someday at a time and place of the government’s choosing. While this may sound like a riff on a bad joke, it’s a bad joke with “we the people” as the punchline. Yet it is no laughing matter that Americans are being jailed for growing orchids, feeding whales, collecting rainwater, and praying in their backyards. There is nothing humorous about Americans having their families terrorized by SWAT teams, their pets killed, their children shot, their homes trashed and their privacy shredded. And there’s really not much comic relief to be found when the citizenry is forced to pay their own government to jail, spy on, censor, terrorize and kill them. The following activities are guaranteed to get you censored, surveilled, eventually placed on a government watch list, possibly detained and potentially killed. Use harmless trigger words like cloud, pork and pirates: The Department of Homeland Security has an expansive list of keywords and phrases it uses to monitor social networking sites and online media for signs of terrorist or other threats. While you’ll definitely send up an alert for using phrases such as dirty bomb, Jihad and Agro terror, you’re just as likely to get flagged for surveillance if you reference the terms SWAT, lockdown, police, cloud, food poisoning, pork, flu, Subway, smart, delays, cancelled, la familia, pirates, hurricane, forest fire, storm, flood, help, ice, snow, worm, warning or social media. Use a cell phone: Simply by using a cell phone, you make yourself an easy target for government agents—working closely with corporations—who can listen in on your phone calls, read your text messages and emails, and track your movements based on the data transferred from, received by, and stored in your cell phone. Mention any of the so-called “trigger” words in a conversation or text message, and you’ll get flagged for sure. Drive a car: Unless you’ve got an old junkyard heap without any of the gadgets and gizmos that are so attractive to today’s car buyers (GPS, satellite radio, electrical everything, smart systems, etc. ), driving a car today is like wearing a homing device: you’ll be tracked from the moment you open that car door thanks to black box recorders and vehicle-to-vehicle communications systems that can monitor your speed, direction, location, the number of miles traveled, and even your seatbelt use. Once you add satellites, GPS devices, license plate readers, and real-time traffic cameras to the mix, there’s nowhere you can go on our nation’s highways and byways that you can’t be followed. By the time you add self-driving cars into the futuristic mix, equipped with computers that know where you want to go before you do, privacy and autonomy will be little more than distant mirages in your rearview mirror. Attend a political rally: Enacted in the wake of 9/11, the Patriot Act redefined terrorism so broadly that many non-terrorist political activities such as protest marches, demonstrations and civil disobedience were considered potential terrorist acts, thereby rendering anyone desiring to engage in protected First Amendment expressive activities as suspects of the surveillance state. Express yourself on social media: The FBI, CIA, NSA and other government agencies are investing in and relying oncorporate surveillance technologies that can mine constitutionally protected speech on social media platforms such as Facebook, Twitter and Instagram in order to identify potential extremists and predict who might engage in future acts of anti-government behavior. A decorated Marine, 26-year-old Brandon Raub was targeted by the Secret Service because of his Facebook posts, interrogated by government agents about his views on government corruption, arrested with no warning, labeled mentally ill for subscribing to so-called “conspiratorial” views about the government, detained against his will in a psych ward for having “dangerous” opinions, and isolated from his family, friends and attorneys. Serve in the military: Operation Vigilant Eagle, the brainchild of the Dept. of Homeland Security, calls for surveillance of military veterans returning from Iraq and Afghanistan, characterizing them as extremists and potential domestic terrorist threats because they may be “disgruntled, disillusioned or suffering from the psychological effects of war.” Police agencies are also using Beware, an “early warning” computer system that tips them off to a potential suspect’s inclination to be a troublemaker and assigns individuals a color-coded threat score—green, yellow or red—based on a variety of factors including one’s criminal records, military background, medical history and social media surveillance. Call in sick to work: In Virginia, a so-called police “welfare check” instigated by a 58-year-old man’s employer after he called in sick resulted in a two-hour, SWAT team-style raid on the man’s truck and a 72-hour mental health hold. During the standoff, a heavily armed police tactical team confronted Benjamin Burruss as he was leaving an area motel, surrounded his truck, deployed a “stinger” device behind the rear tires, launched a flash grenade, smashed the side window in order to drag him from the truck, handcuffed and searched him, and transported him to a local hospital for a psychiatric evaluation and mental health hold. All of this was done despite the fact that police acknowledged they had no legal basis nor probable cause for detaining Burruss, given that he had not threatened to harm anyone and was not mentally ill.
Limp or stutter: As a result of a nationwide push to certify a broad spectrum of government officials in mental health first-aid training (a 12-hour course comprised of PowerPoint presentations, videos, discussions, role playing and other interactive activities), more Americans are going to run the risk of being reported for having mental health issues by non-medical personnel. Mind you, once you get on such a government watch list—whether it’s a terrorist watch list, a mental health watch list, or a dissident watch list—there’s no clear-cut way to get off, whether or not you should actually be on there. For instance, one 37-year-old disabled man was arrested, diagnosed by police and an unlicensed mental health screener as having “mental health issues,” apparently because of his slurred speech and unsteady gait, and subsequently locked up for five days in a mental health facility against his will and with no access to family and friends. A subsequent hearing found that Gordon Goines, who suffers from a neurological condition similar to multiple sclerosis, has no mental illness and should not have been confined. Allow yourself to be seen in public waving a toy gun or anything remotely resembling a gun, such as a water nozzle or a remote control or a walking cane, for instance: No longer is it unusual to hear about incidents in which police shoot unarmed individuals first and ask questions later. John Crawford was shot by police in an Ohio Wal-Mart for holding an air rifle sold in the store that he may have intended to buy. Thirteen-year-old Andy Lopez Cruz was shot 7 times in 10 seconds by a California police officer who mistook the boy’s toy gun for an assault rifle. Christopher Roupe, 17, was shot and killed after opening the door to a police officer. The officer, mistaking the Wii remote control in Roupe’s hand for a gun, shot him in the chest. Another police officer repeatedly shot 70-year-old Bobby Canipe during a traffic stop. The cop saw the man reaching for his cane and, believing the cane to be a rifle, opened fire. Stare at a police officer: Miami-Dade police slammed the 14-year-old Tremaine McMillian to the ground, putting him in a chokehold and handcuffing him after he allegedly gave them “dehumanizing stares” and walked away from them, which the officers found unacceptable. Appear to be pro-gun, pro-freedom or anti-government: You might be a domestic terrorist in the eyes of the FBI (and its network of snitches) if you: express libertarian philosophies (statements, bumper stickers); exhibit Second Amendment-oriented views (NRA or gun club membership); read survivalist literature, including apocalyptic fictional books; show signs of self-sufficiency (stockpiling food, ammo, hand tools, medical supplies); fear an economic collapse; buy gold and barter items; subscribe to religious views concerning the book of Revelation; voice fears about Big Brother or big government; expound about constitutional rights and civil liberties; or believe in a New World Order conspiracy. This is all part of a larger trend in American governance whereby dissent is criminalized and pathologized, and dissenters are censored, silenced or declared unfit for society. Attend a public school: Microcosms of the police state, America’s public schools contain almost every aspect of the militarized, intolerant, senseless, overcriminalized, legalistic, surveillance-riddled, totalitarian landscape that plagues those of us on the “outside.” From the moment a child enters one of the nation’s 98,000 public schools to the moment she graduates, she will be exposed to a steady diet of draconian zero tolerance policies that criminalize childish behavior, overreaching anti-bullying statutes that criminalize speech, school resource officers (police) tasked with disciplining and/or arresting so-called “disorderly” students, standardized testing that emphasizes rote answers over critical thinking, politically correct mindsets that teach young people to censor themselves and those around them, and extensive biometric and surveillance systems that, coupled with the rest, acclimate young people to a world in which they have no freedom of thought, speech or movement. Additionally, as part of the government’s so-called ongoing war on terror, the FBI—the nation’s de facto secret police force—is now recruiting students and teachers to spy on each other and report anyone who appears to have the potential to be “anti-government” or “extremist” as part of its “Don’t Be a Puppet” campaign. Speak truth to power: Long before Chelsea Manning and Edward Snowden were being castigated for blowing the whistle on the government’s war crimes and the National Security Agency’s abuse of its surveillance powers, it was activists such as Martin Luther King Jr. and John Lennon who were being singled out for daring to speak truth to power. These men and others like them had their phone calls monitored and data files collected on their activities and associations. For a little while, at least, they became enemy number one in the eyes of the U.S. government. There’s always a price to pay for standing up to the powers-that-be. Yet as this list shows, you don’t even have to be a dissident to get flagged by the government for surveillance, censorship and detention. All you really need to be is a citizen of the American police state. In other words, you might already be flagged as potentially anti-government in a government database somewhere—Main Core, for example—that identifies and tracks individuals who aren’t inclined to march in lockstep to the police state’s dictates. As The Intercept recently reported, the FBI, CIA, NSA and other government agencies are increasingly investing in and relying on corporate surveillance technologies that can mine constitutionally protected speech on social media platforms such as Facebook, Twitter and Instagram in order to identify potential extremists and predict who might engage in future acts of anti-government behavior. Now all it needs is the data, which more than 90% of young adults and 65% of American adults are happy to provide. When people talk about privacy, they mistakenly assume it protects only that which is hidden behind a wall or under one’s clothing. The courts have fostered this misunderstanding with their constantly shifting delineation of what constitutes an “expectation of privacy.” And technology has furthered muddied the waters. However, privacy is so much more than what you do or say behind locked doors. It is a way of living one’s life firm in the belief that you are the master of your life, and barring any immediate danger to another person (which is far different from the carefully crafted threats to national security the government uses to justify its actions), it’s no one’s business what you read, what you say, where you go, whom you spend your time with, and how you spend your money. George Orwell’s 1984—where “you had to live—did live, from habit that became instinct—in the assumption that every sound you made was overheard, and, except in darkness, every movement scrutinized”—has become our reality. As I point out in my book Battlefield America: The War on the American People, this doesn’t even begin to touch on the corporate trackers that monitor your purchases, web browsing, Facebook posts and other activities taking place in the cyber sphere. For example, police have been using Stingray devices mounted on their cruisers to intercept cell phone calls and text messages without court-issued search warrants. Doppler radar devices, which can detect human breathing and movement within in a home, are already being employed by the police to deliver arrest warrants and are being challenged in court. License plate readers, yet another law enforcement spying device made possible through funding by the Department of Homeland Security, can record up to 1800 license plates per minute. Moreover, these surveillance cameras can also photograph those inside a moving car. Reports indicate that the Drug Enforcement Administration has been using the cameras in conjunction with facial recognition software to build a “vehicle surveillance database” of the nation’s cars, drivers and passengers. State and federal law enforcement agencies are pushing to expand their biometric and DNA databases by requiring that anyone accused of a misdemeanor have their DNA collected and catalogued. However, technology is already available that allows the government to collect biometrics such as fingerprints from a distance, without a person’s cooperation or knowledge. One system can actually scan and identify a fingerprint from nearly 20 feet away. 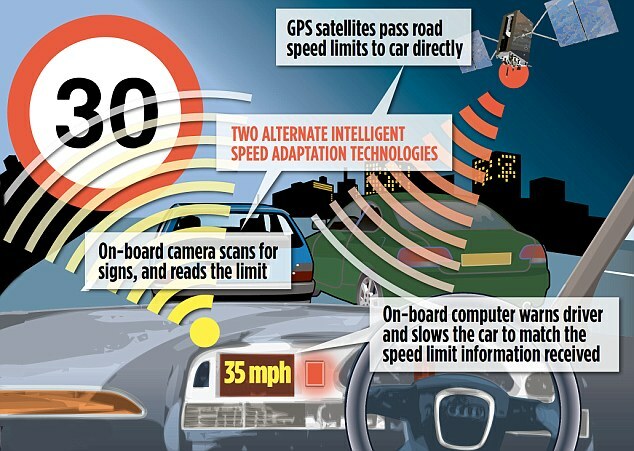 Developers are hard at work on a radar gun that can actually show if you or someone in your car is texting. Another technology being developed, dubbed a “textalyzer” device, would allow police to determine whether someone was driving while distracted. Refusing to submit one’s phone to testing could result in a suspended or revoked driver’s license. It’s a sure bet that anything the government welcomes (and funds) too enthusiastically is bound to be a Trojan horse full of nasty, invasive surprises. Case in point: police body cameras. Hailed as the easy fix solution to police abuses, these body cameras—made possible by funding from the Department of Justice—will turn police officers into roving surveillance cameras. Of course, if you try to request access to that footage, you’ll find yourself being led a merry and costly chase through miles of red tape, bureaucratic footmen and unhelpful courts. 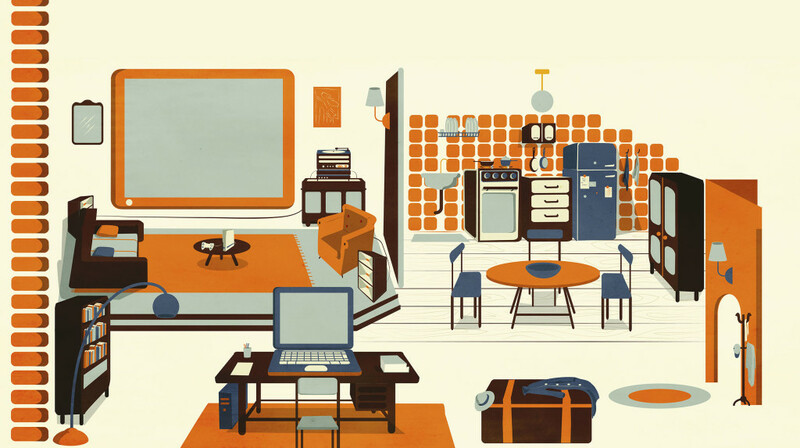 The “internet of things” refers to the growing number of “smart” appliances and electronic devices now connected to the internet and capable of interacting with each other and being controlled remotely. These range from thermostats and coffee makers to cars and TVs. Of course, there’s a price to pay for such easy control and access. That price amounts to relinquishing ultimate control of and access to your home to the government and its corporate partners. For example, while Samsung’s Smart TVs are capable of “listening” to what you say, thereby allowing users to control the TV using voice commands, it also records everything you say and relays it to a third party, e.g., the government. Drones, which are taking to the skies en masse, are the converging point for all of the weapons and technology already available to law enforcement agencies. In fact, drones that can listen in on your phone calls, see through the walls of your home, scan your biometrics, photograph you and track your movements, and even corral you with sophisticated weaponry. Technology has upped the stakes dramatically. All of these technologies add up to a society in which there’s little room for indiscretions, imperfections, or acts of independence—especially not when the government can listen in on your phone calls, monitor your driving habits, track your movements, scrutinize your purchases and peer through the walls of your home. If, as it seems, we are in the process of becoming a totalitarian society in which the state apparatus is all-powerful, the ethics most important for the survival of the true, free, human individual would be: cheat, lie, evade, fake it, be elsewhere, forge documents, build improved electronic gadgets in your garage that’ll outwit the gadgets used by the authorities. There is no gray area any longer. The overt and costly signs of the despotism exercised by the increasingly authoritarian regime that passes itself off as the United States government are all around us: warrantless surveillance of Americans’ private phone and email conversations by the NSA; SWAT team raids of Americans’ homes; shootings of unarmed citizens by police; harsh punishments meted out to schoolchildren in the name of zero tolerance; drones taking to the skies domestically; endless wars; out-of-control spending; militarized police; roadside strip searches; roving TSA sweeps; privatized prisons with a profit incentive for jailing Americans; fusion centers that collect and disseminate data on Americans’ private transactions; and militarized agencies with stockpiles of ammunition, to name some of the most appalling. Meanwhile, the three branches of government (Executive, Legislative and Judicial) and the agencies under their command—Defense, Commerce, Education, Homeland Security, Justice, Treasury, etc.—have switched their allegiance to the Corporate State with its unassailable pursuit of profit at all costs and by any means possible. As a result, we are now ruled by a government consumed with squeezing every last penny out of the population and seemingly unconcerned if essential freedoms are trampled in the process. As with most things, if you want to know the real motives behind any government program, follow the money trail. When you dig down far enough, as I document in my book Battlefield America: The War on the American People, you quickly find that those who profit from Americans being surveilled, fined, scanned, searched, probed, tasered, arrested and imprisoned are none other than the police who arrest them, the courts which try them, the prisons which incarcerate them, and the corporations, which manufacture the weapons, equipment and prisons used by the American police state. Examples of this legalized, profits-over-people, government-sanctioned extortion abound. In the schools: The security industrial complex with its tracking, spying, and identification devices has set its sights on the schools as “a vast, rich market”—a $20 billion market, no less—just waiting to be conquered. In fact, the public schools have become a microcosm of the total surveillance state which currently dominates America, adopting a host of surveillance technologies, including video cameras, finger and palm scanners, iris scanners, as well as RFID and GPS tracking devices, to keep constant watch over their student bodies. Likewise, the military industrial complex with its military weapons, metal detectors, and weapons of compliance such as tasers has succeeded in transforming the schools—at great taxpayer expense and personal profit—into quasi-prisons. Rounding things out are school truancy laws, which come disguised as well-meaning attempts to resolve attendance issues in the schools but in truth are nothing less than stealth maneuvers aimed at enriching school districts and court systems alike through excessive fines and jail sentences for “unauthorized” absences. Curiously, none of these efforts seem to have succeeded in making the schools any safer. On the roads: It has long been understood that police departments have quotas for how many tickets are issued and arrests made per month, a number tied directly to revenue. Likewise, red light camera schemes—sold to communities as a means of minimizing traffic accidents at intersections but which in fact are just a vehicle for levying nuisance fines against drivers often guilty of little more than making a right-hand turn on a red light—have been shown to do little to increase safety while actually contributing to more accidents. Nevertheless, these intrusive, money-making scams, which also function as surveillance cameras, are being inflicted on unsuspecting drivers by revenue-hungry municipalities, despite revelations of corruption, collusion and fraud. In the prisons: States now have quotas to meet for how many Americans go to jail. Increasing numbers of states have contracted to keep their prisons at 90% to 100% capacity. This profit-driven form of mass punishment has, in turn, given rise to a $70 billion private prison industry that relies on the complicity of state governments to keep the money flowing and their privately run prisons full, “regardless of whether crime was rising or falling.” As Mother Jones reports, “private prison companies have supported and helped write … laws that drive up prison populations. Their livelihoods depend on towns, cities, and states sending more people to prison and keeping them there.” Private prisons are also doling out harsher punishments for infractions by inmates in order to keep them locked up longer in order to “boost profits” at taxpayer expense. All the while, the prisoners are being forced to provide cheap labor for private corporations. No wonder the United States has the largest prison population in the world at a time when violent crime is at an all-time low. In the endless wars abroad: Fueled by the profit-driven military industrial complex, the government’s endless wars is wreaking havoc on our communities, our budget and our police forces. Having been co-opted by greedy defense contractors, corrupt politicians and incompetent government officials, America’s expanding military empire is bleeding the country dry at a rate of more than $57 million an hour, and that’s just the budget for the Dept. of Defense for 2016, with its 1000-plus U.S. military bases spread around the globe. Incredibly, although the U.S. constitutes only 5% of the world’s population, America boasts almost 50% of the world’s total military expenditure, spending more on the military than the next 19 biggest spending nations combined. In fact, the Pentagon spends more on war than all 50 states combined spend on health, education, welfare, and safety. In the form of militarized police: The Department of Homeland Security routinely hands out six-figure grants to enable local municipalities to purchase military-style vehicles, as well as a veritable war chest of weaponry, ranging from tactical vests, bomb-disarming robots, assault weapons and combat uniforms. This rise in military equipment purchases funded by the DHS has, according to analysts Andrew Becker and G.W. Schulz, “paralleled an apparent increase in local SWAT teams.” The end result? An explosive growth in the use of SWAT teams for otherwise routine police matters, an increased tendency on the part of police to shoot first and ask questions later, and an overall mindset within police forces that they are at war—and the citizenry are the enemy combatants. 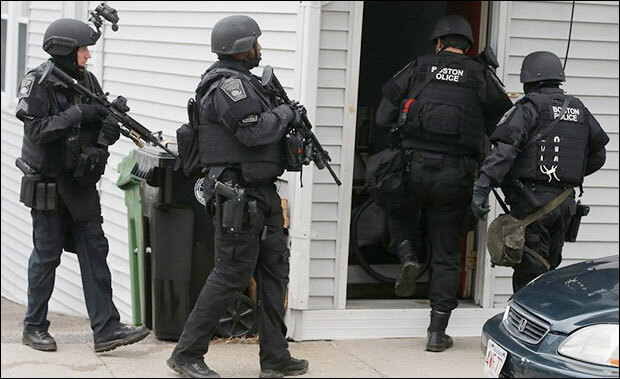 Over 80,000 SWAT team raids are conducted on American homes and businesses each year. Moreover, government-funded military-style training drills continue to take place in cities across the country. These Urban Shield exercises, elaborately staged with their own set of professionally trained Crisis Actors playing the parts of shooters, bystanders and victims, fool law enforcement officials, students, teachers, bystanders and the media into thinking it’s a real crisis. By the security industrial complex: Not only is the government spying on Americans’ phone calls and emails, but police are also being equipped with technology such as Stingray devices that can track your cell phone, as well as record the content of your calls and the phone numbers dialed. The DHS has distributed more than $50 million in grants—again, paid by taxpayers—to enable local police agencies to acquire license plate readers, which rely on mobile cameras to photograph and identify cars, match them against a national database, and track their movements. Relying on private contractors to maintain a license plate database allows the DHS and its affiliates to access millions of records without much in the way of oversight. That doesn’t even touch on what the government’s various aerial surveillance devices are tracking, or the dangers posed to the privacy and safety of those on the ground. These injustices, petty tyrannies and overt acts of hostility are being carried out in the name of the national good—against the interests of individuals, society and ultimately our freedoms—by an elite class of government officials working in partnership with megacorporations that are largely insulated from the ill effects of their actions. This perverse mixture of government authoritarianism and corporate profits has increased the reach of the state into our private lives while also adding a profit motive into the mix. And, as always, it’s we the people, we the taxpayers, we the gullible voters who keep getting taken for a ride by politicians eager to promise us the world on a plate. This is a far cry from how a representative government is supposed to operate. Indeed, it has been a long time since we could claim to be the masters of our own lives. Rather, we are now the subjects of a militarized, corporate empire in which the vast majority of the citizenry work their hands to the bone for the benefit of a privileged few. Adding injury to the ongoing insult of having our tax dollars misused and our so-called representatives bought and paid for by the moneyed elite, the government then turns around and uses the money we earn with our blood, sweat and tears to target, imprison and entrap us, in the form of militarized police, surveillance cameras, private prisons, license plate readers, drones, and cell phone tracking technology. All of those nefarious deeds that you read about in the paper every day: those are your tax dollars at work. It’s your money that allows for government agents to spy on your emails, your phone calls, your text messages, and your movements. It’s your money that allows out-of-control police officers to burst into innocent people’s homes, or probe and strip search motorists on the side of the road. And it’s your money that leads to innocent Americans across the country being prosecuted for innocuous activities such as raising chickens at home, growing vegetable gardens, and trying to live off the grid. 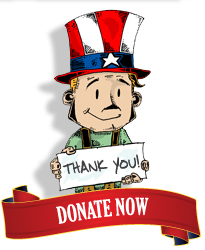 Just remember the next time you see a news story that makes your blood boil, whether it’s a police officer arresting someone for filming them in public, or a child being kicked out of school for shooting an imaginary arrow, or a homeowner being threatened with fines for building a pond in his backyard, remember that it is your tax dollars that are paying for these injustices. But what if we didn’t just pull out our pocketbooks and pony up to the federal government’s outrageous demands for more money? What if we didn’t just dutifully line up to drop our hard-earned dollars into the collection bucket, no questions asked about how it will be spent? What if, instead of quietly sending in our checks, hoping vainly for some meager return, we did a little calculating of our own and started deducting from our taxes those programs that we refuse to support? If we don’t have the right to decide what happens to our hard-earned cash, then we don’t have very many rights at all. If they can just take from you what they want, when they want, and then use it however they want, you can’t claim to be anything more than a serf in a land they think of as theirs. This was the case in the colonial era, and it’s the case once again. The United States of America, that dream of what a democratic republic ought to be, has become the Fascist States of America. As the 2016 elections have more than revealed, we have moved beyond the era of representative government and have entered into a new age. You can call it the age of authoritarianism. Or fascism. Or oligarchy. Either way, argues John W. Whitehead in this week’s vodcast, we are being played for fools. TRENTON, N.J. — Attorneys for The Rutherford Institute are planning to appeal the dismissal of a First Amendment lawsuit involving two street preachers who were charged with trespass and obstruction of justice and arrested for allegedly refusing police orders to cease proselytizing at a Princeton train station. In coming to the defense of evangelical preachers Don Karns and Robert Parker, Rutherford Institute attorneys are challenging as discriminatory an alleged policy by the New Jersey Transit Corporation (NJTC), enforced by the NJTC police, that requires religious speakers to acquire a permit in order to engage in non-commercial speech at the station while waiving the requirement for political speakers. In dismissing the lawsuit against the police and NJTC, the U.S. District Court for New Jersey granted absolute immunity to the Corporation and ruled that because there was no clear law granting individuals the right to engage in speech on the train platforms, the police officers did not clearly violate the First or Fourth Amendment rights of the street preachers. On June 26, 2012, evangelical preachers Don Karns and Robert Parker went to the Princeton Junction Station of the NJTC and began sharing their Christian beliefs with others at the station. No notices were posted at the station that engaging in First Amendment expression was in any way restricted at the station. Upon arriving at the station, NJTC police officers Kathleen Shanahan and Sandra McKeon Crowe demanded identification from Karns and Parker, informed the preachers that a permit was required in order to engage in non-commercial speech, and ordered them to cease preaching in the absence of a permit. Karns and Parker asserted the train platform was a public area and that they had a First Amendment right to engage in speech there. Parker also attempted to record the interaction with the police using his cell phone, but was ordered to stop doing so by the officers. The preachers were subsequently arrested and charged under New Jersey law with defiant trespass and obstructing an investigation. They were eventually acquitted on all of the charges. Attorneys for The Rutherford Institute filed suit against the police and the NJTC accusing them of violating the First Amendment preachers’ rights, discriminating against them based on the religious content of their speech, and violating their Fourth Amendment rights by arresting them without probable cause. Attorney F. Michael Daily of Westmont, N.J., is assisting The Rutherford Institute in its defense of Don Karns’ and Nathan Magnusen’s First Amendment rights. When presidential candidate Hillary Clinton declares that unborn babies do not have constitutional rights, she’s not just spouting partisan rhetoric in the heated national debate over abortion. She’s providing us with a glimpse into an increasingly troubling mindset among government officials who believe that the government not only has the power to determine who is deserving of constitutional rights in the eyes of the law but also has the authority to deny those rights to an American citizen. The unborn are not the only persons being denied their rights under the Constitution. American families who have their dogs shot, their homes trashed and their children terrorized or, worse, killed by errant SWAT team raids in the middle of the night are being denied their rights under the Constitution. Disabled individuals who are being strip searched, handcuffed, arrested and “diagnosed” by police as dangerous or mentally unstable merely because they stutter and walk unevenly are being denied their rights under the Constitution. School-aged children as young as 4-years-old who are leg shackled, handcuffed and strip searched for violating school zero tolerance policies by chewing a Pop Tart into the shape of a gun and playing an imaginary game of cops and robbers, or engaging in childish behavior such as crying or jumping are being denied their rights under the Constitution. Unarmed citizens who are tasered or shot by police for daring to hesitate, stutter, move a muscle, flee or disagree in any way with a police order are being denied their rights under the Constitution. Likewise, Americans—young and old alike—who are shot by police because they pointed a garden hose at a police officer, reached for their registration in their glove box, relied upon a cane to steady themselves, or were seen playing with air rifles or BB guns are being denied their rights under the Constitution. Female motorists who are unlucky enough to be pulled over for a questionable traffic infraction only to be subjected by police to cavity searches by the side of the road are being denied their rights under the Constitution. Male pedestrians and motorists alike who are being subjected to roadside strip searches and rectal probes by police based largely on the color of their skin are being denied their rights under the Constitution. American citizens subjected to government surveillance whereby their phone calls are being listened in on, their mail and text messages read, their movements tracked and their transactions monitored are being denied their rights under the Constitution. The same goes for individuals who are being denied access to body camera footage of their interactions with police, school officials and even medical professionals. Homeowners who are being fined and arrested for raising chickens in their backyard, allowing the grass in their front yards to grow too long, and holding Bible studies in their homes are being denied their rights under the Constitution. Decorated military veterans who are being arrested for criticizing the government on social media such as Facebook are being denied their rights under the Constitution. Homeless individuals who are being harassed, arrested and run out of towns by laws that criminalize homelessness are being denied their rights under the Constitution. Individuals whose DNA has been forcibly collected and entered into federal and state law enforcement databaseswhether or not they have been convicted of any crime are being denied their rights under the Constitution. Drivers whose license plates are being scanned, uploaded to a police database and used to map their movements, whether or not they are suspected of any crime, are being denied their rights under the Constitution. The same goes fordrivers who are being ticketed for running afoul of red light cameras without any real opportunity to defend themselves against such a charge are being denied their rights under the Constitution. Protesters and activists who are being labeled domestic terrorists and extremists and accused of hate crimes for speaking freely are being denied their rights under the Constitution. Likewise, American citizens who being targeted for assassination by drone strikes abroad without having been charged, tried and convicted of treason are being denied their rights under the Constitution. Hard-working Americans whose bank accounts, homes, cars, electronics and cash are seized by police (operating according to asset forfeiture schemes that provide profit incentives for highway robbery) are being denied their rights under the Constitution. So what is the common denominator here? These are all American citizens—endowed by their Creator with certain unalienable rights, rights that no man or government can take away from them, among these the right to life, liberty and the pursuit of happiness—and they are all being oppressed in one way or another by a government that has grown drunk on power, money and its own authority. If the government—be it the President, Congress, the courts or any federal, state or local agent or agency—can decide that any person has no rights, then that person becomes less than a citizen, less than human, less than deserving of respect, dignity, civility and bodily integrity. He or she becomes an it, a faceless number that can be tallied and tracked, a quantifiable mass of cells that can be discarded without conscience, an expendable cost that can be written off without a second thought, or an animal that can be bought, sold, branded, chained, caged, bred, neutered and euthanized at will. It’s a slippery slope that justifies all manner of violations in the name of national security, the interest of the state and the so-called greater good. Yet those who founded this country believed that what we conceive of as our rights were given to us by God—we are created equal, according to the nation’s founding document, the Declaration of Independence—and that government cannot create nor can they extinguish our God-given rights. To do so would be to anoint the government with god-like powers and elevate it above the citizenry. Unfortunately, as I point out in my book Battlefield America: The War on the American People, we have been dancing with this particular devil for quite some time now, allowing the government to dictate to us, rather than “we the people” giving marching orders to those whose paychecks are funded with taxpayer dollars. If we continue to wait for the government to restore our freedoms, respect our rights, rein in its abuses and restrain its agents from riding roughshod over our lives, our liberty and our happiness, then we will be waiting forever. But how do we demand freedom from our oppressor? Start by studying history. Take note of the movements that succeeded and the ones that failed. Adopt the tactics of those who successfully brought about reform through nonviolent resistance. Think nationally, but act locally. If you’re not prepared to challenge injustice in your own community, when it happens in your own backyard, then there can be no hope for reining in the government’s abuses at the national level. Most of all, stop giving the government the power to play god—all-knowing, all-seeing and all-powerful—and start putting it in its rightful place as our servant: an institution that derives its powers from the consent of the governed (“we the people”) whose primary purpose is to safeguard our rights.